To see any of the posts, please click on the hyperlinked text (not the image). Many thanks to everyone who has been reading this summer. Also, I am especially grateful to my wife for the beautiful illustrations. More of her artwork and blog posts are available at Red Newt Gallery. Have a wonderful week! For years, floodwaters submerged the earth. If not for Raven and Loon, humans would never have recovered. Loon persuaded Great Spirit, the powerful cloud-dwelling deity, to help restore the world, and then Raven led the people to land. Thanks to these two birds, civilization prospered again. This story comes from the Haida, aboriginal residents of western Canada’s coastal region (1). 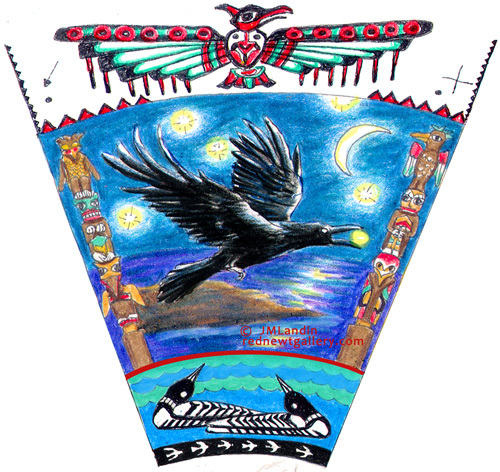 Still central to their culture, the raven acts as a major tribal crest and totem (2, 3). In fact, native people from eastern Siberia (4) through Alaska (5) and down into northwestern parts of the United States (6) continue to venerate ravens and crows. Other indigenous cultures of the world have incorporated these birds into their lore. Crows, for instance, appear in several just-so stories of the Australian Aborigines (7), while southern Africa’s Masai people have a tale about a crow seducing and marrying a woman (8). Numerous myths like these exist. Regardless of the source, portrayals frequently acknowledge this bird’s clever “trickster” nature. The subjects of tribal culture are immense, even when considering only current populations. Estimates identify more than 5,000 tribes of indigenous people exist throughout the world (11). Climate and geography separate most of these groups, as do language and traditions. Nevertheless, when taken as a whole, the beliefs and customs of these communities exhibit several common features. Paramount among these: the broad integration of all aspects of a village’s surroundings into the group’s social and religious practices, ranging from familial connections to bonds forged with wildlife. After all, for such cultures, survival is based on the understanding and appreciation of mutual relationships (12). Thus, the individual is closely aligned with his or her tribe, and the tribe with its natural environment. In such societies, little separation is perceived to exist between people and other creatures. Animals, in the forms of deities and spirits, generally possess anthropomorphized features. Some communities even regard themselves as descendants of such beings. In this way, Siberia’s Buryat claim lineage from the eagle and the swan (13). Similarly, Australian Aboriginal tribes associate themselves with specific animals, so that one clan claims a totemic connection to the kangaroo, another clan to the emu, and yet another to a species of cockatoo (14). Such cultures largely acknowledge a plurality of divinities and nature spirits who represent different tribal communities and non-human creatures. Lots of deities and spirit beings have ties to the avian world. Ravens and loons, as noted previously, inhabit tales of several cultures. According to Africa’s Tsonga, the “first man” sprang from an egg laid by the bird-like deity named N’wari (15). For the Rapa Nui people of Easter Island, the god who reigns over frigatebirds, sandpipers, terns, petrels and native avian fauna is also credited with creating the world. This immortal figure goes by the name of Makemake (16). Kane, a god associated with the albatross, holds similar roles for the indigenous people of Hawaii, Tahiti, and other Pacific islands (17). And, of course, the mythical thunderbird, a powerful supernatural creature akin to a gigantic eagle, remains popular in native North American legends (18). 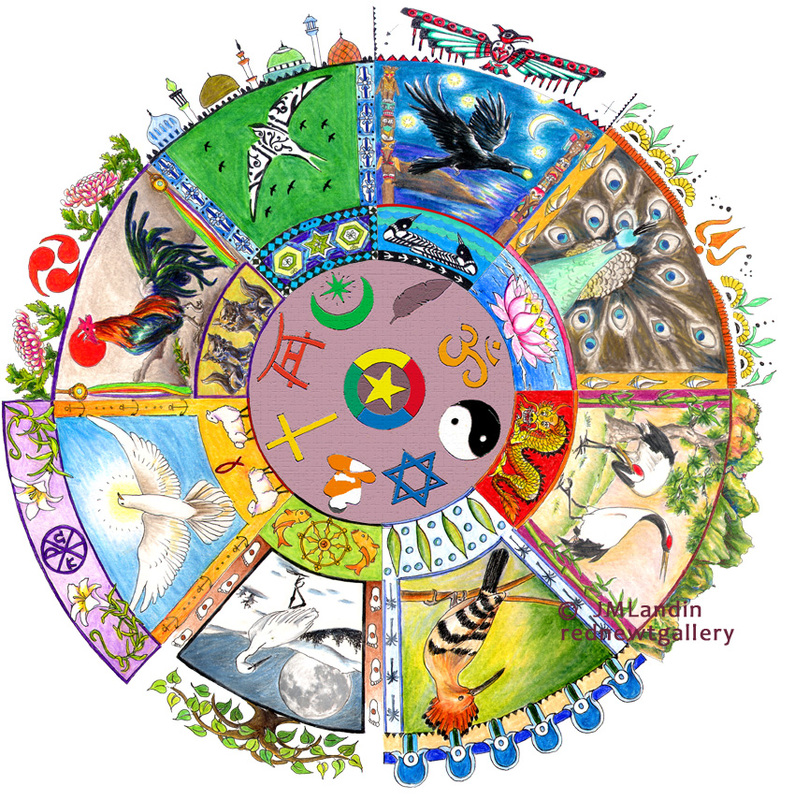 In the world’s major religions, birds generally serve as symbols. Tribal beliefs employ these kinds of associations as well. The Maori of New Zealand liken the migratory birds proceeding out from Spirits Bay, especially a type of godwit, to souls making their way to the afterworld (19). For some Siberian peoples, the loon is deemed a psychopomp (20). Some folks in the Yucatan region of Mexico still speak of Yum Cimil, a Mayan deity of the underworld connected with the owl (21, 22). As a bird of the night, the owl also is linked to Masau’u, an important and complex Hopi / Pueblo god known as “Skeleton Man,” whose dominion includes both death and fertility (23, 24). Avian life, however, resonates with indigenous peoples in approaches extending well beyond symbolic representation. This is evident when individuals and clans identify with birds as spiritual guides and totems. An assortment of other examples abound. Practices of South America’s native peoples utilize fat from flamingos, cormorants, and other birds for healing purposes (25). The Kwanga from the Sepik region of Papua New Guinea fashion daggers from the claw bones of cassowaries, associating the birds’ lethal strikes with the weapons (26). And the customs of North American Great Plains tribal communities require specific kinds of feathers for ceremonial dress (27). Regarding the latter, an old Cheyenne story explains how a chief in his youth learned from eagles to properly use their feathers in making warbonnets (28). On the whole, a convergence of the tangibly practical with the spiritually meaningful prevails among native cultures. Tribal communities generally regard their winged neighbors with a reverence unseen in much of today’s industrialized world. A key reason for this is likely due to the familiarity indigenous cultures have with wildlife, an intimacy that fosters a sense of kinship with nature. Unfortunately, all of this could change. The rapid rise of global technology and market forces may eventually deluge the remaining tribal peoples and their ways of life. If this happens, how will they respond? Will they abandon their heritage? Or can they look to birds—like their forebears—to guide them through the sweeping tides of “progress” towards another new beginning? Meyers, EC. Totem Tales: Legends from the Rainforest. Blaine, WA: Hancock House Publishing, 2008. pp. 5–8. Holm, B. Spirit and Ancestor: A Century of Northwest Coast Indian Art at the Burke Museum. Seattle: Burke Museum, University of Washington Press, 1987. p. 180. Werness, HB. The Continuum Encyclopedia of Animal Symbolism in Art. New York: The Continuum International Publishing Group, 2004. p. 151. Hultkrantz, A. The Religions of the American Indians. Setterwall, M. (translator). Berkeley, CA: University of California Press, 1981. p. 36. Hunn, ES, Thornton, TF. “Tlingit Birds: An Annotated List with a Statistical Comparative Analysis.” Tidemann, S, Gosler, A. (editors). Ethno-ornithology. Washington, DC: Earthscan, 2011. pp. 183–185. Tidemann, S, Whiteside, T. “Aboriginal Stories: The Riches and Colour of Australian Birds,” Tidemann, S, Gosler, A. (editors). Ethno-ornithology. Washington, DC: Earthscan, 2011. pp. 161–162, 171–173. Hollis, AC. Masai Myths, Tales and Riddles. Mineola, NY: Dover Publications, 2003. pp. 26–27. Armstrong, EA. The New Naturalist: A Survey of British Natural History – The Folklore of Birds: An Enquiry into the Origin & Distribution of Some Magico-Religious Traditions. London: Willmer Brothers & Haram Ltd., 1958. p. 68. Yolen, J. (editor). Favorite Folktales from Around the World. New York: Pantheon Books, 1986. pp. 105–107. “Who Are Indigenous Peoples,” First Peoples Worldwide: http://www.firstpeoples.org/who-are-indigenous-peoples. “How Our Societies Work,” First Peoples Worldwide: http://www.firstpeoples.org/who-are-indigenous-peoples/how-our-societies-work. Lawlor, R. Voices of the First Day: Awakening in the Aboriginal Dreamtime. Rochester, VT: Inner Traditions International, 1991. pp. 279–283. Allan, T, Fleming, F, and Phillips, C. World Mythologies: African Myths and Beliefs. New York: Rosen Publishing, 2012. p. 39. Wilkinson, P, Philip, N. Mythology. New York: Dorling Kindersley, 2007. pp. 258–259. Beckwith, M. Hawaiian Mythology. Honolulu: University of Hawaii Press, 1976. p. 92.
Cooper, G. World Mythology. Willis, R. (editor). New York: Henry Holt and Company, First Owl Books Edition, 1996. p. 225. Andrews, T. Animal-Speak: The Spiritual & Magical Powers of Creatures Great & Small. St. Paul, MN: Llewellyn Publications, 2000. p. 164. Bowers, AL, Perez, RC. Birds of the Mayas: A Collection of Mayan Folk Tales. Big Moose, NY: West-of-the-Wind Publications, 1964. p. 19. Alexander, HB. The Mythology of All Races (Volume XI: Latin-American). Gray, L.H. (editor). Boston: Marshall Jones Company, 1920. pp. 138-140. Tyler, HA. Pueblo Gods and Myths. Norman, OK: University of Oklahoma Press, 1964. pp. 3-48. Tidemann, S, Chirgwin, S., Sinclair, R. “Indigenous Knowledges, Birds that Have ‘Spoken’ and Science,” Tidemann, S, Gosler, A. (editors). Ethno-ornithology. Washington, DC: Earthscan, 2011. p. 9. Kjellgren, E, et al. Oceania: Art of the Pacific Islands in the Metropolitan Museum of Art. O’Neill, JP. (editor). New York: The Metropolitan Museum of Art, 2007. p. 61. Edmonds, M, Clark, EE. Voices of the Winds: Native American Legends. New York: Facts on File, 1989. p. 186.